I'm thinking Enoplognatha ovata, juvenile. This spider was eating a baby orb weaver (probably baby Cross Spider) I've also seen the zebra spiders making meals of these hatchlings. So far I've seen about six batches of Cross Spiders hatch, and that's just the ones I've seen. 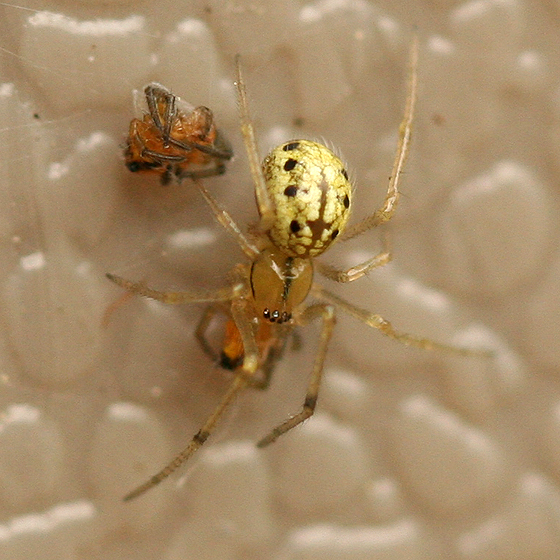 Moved from Enoplognatha ovata lineata. What is the story on this one? Does the subspecies actually exist? Just wondering what your motivation was. Confirmed by R. Crawford. He also says "The only other possibility would be the sibling E.latimana, and that typically has smaller black spots." That's what it looks like to me, too (not that I've ever seen one). Tell me, why do you say that it is probably a juvenile? I'm just asking, not second-guessing. Is it because of the large size of the spots? Or the size (which I can't really tell here, although if those are spiderlings then she can't be too large). Interesting, in my Kaston "How to Know the Spiders" book he mentions Enoplognatha lineatum as not having the middle area red, but lineatum has apparently been combined together with E. ovata, which I assume is what you have.